I received this press release couple of days ago from Reef Nutrition. 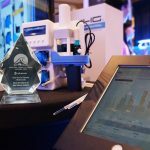 We did an exclusive interview for Reefs.com about this news several months ago, talking with Chad Clayton of Reef Nutrition and AP Breeds during Reef A Palooza Orlando 2017. TDO, already a wildly popular food among breeders and hobbyists alike turned to science to improve their already-impressive pelletized food. For this video, we got together with Chad Clayton of Reef Nutrition where we talked about their revamp of (the) already insanely popular and nutritious TDO pellets. They partnered up with several universities for (research) and no offer pellets that (contain) DOUBLE the amount of (astaxanthin) for the reddest reds and whitest whites. food Hatchery Manager and Research Specialist. 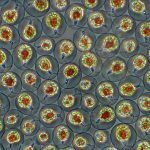 The research evaluated the color of Amphiprion ocellaris that were fed Reed Mariculture Inc.’s TDO Chroma BOOST™ fish and coral feed with the red carotenoid astaxanthin added at levels of 0, 150, 250, 400, 640 and 1,020 ppm for seven weeks. 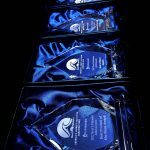 There were 40 juvenile fish per astaxanthin level in the study, for a total of 240 fish. Subjective evaluations of color were made by a panel of six local retail pet store owners experienced in the sale of clownfish. Panelists were first tested to confirm that they could visually discriminate between different colors by means of triangle tests. Then the panelists assigned a color preference score using a scale of 0 (lowest preference) to 9 (highest preference) to the fish fed TDO Chroma BOOST with the different levels of astaxanthin. 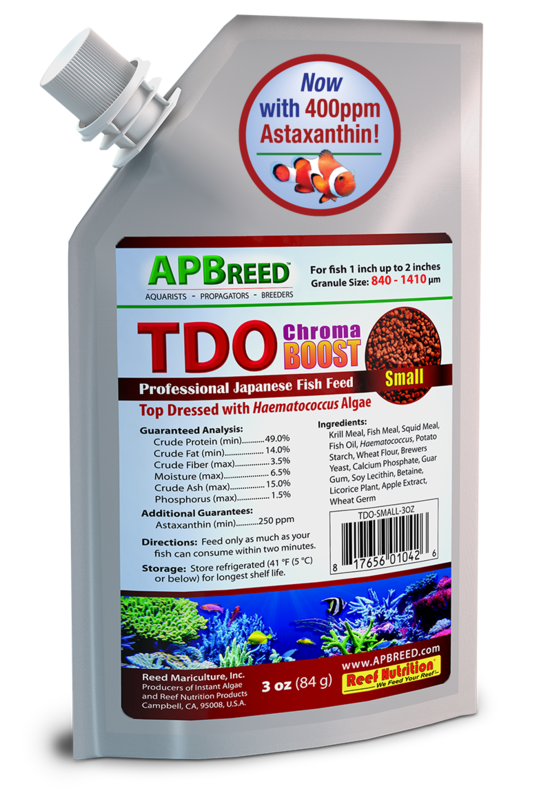 The clear favorite, with an average score of 8.3, was TDO Chroma BOOST with 400 ppm of astaxanthin when reds were optimum and whites were at their brightest. The results of the study led Reed Mariculture to reformulate TDO Chroma BOOST to include 400 ppm astaxanthin. 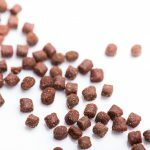 The granule/pellet feed is available in seven different sizes, and multi-size packs are also available. The feed is marketed by two Reed Mariculture product lines, Reef Nutrition® and APBreed™ for use with salt and freshwater fish, and corals. It provides high quality fish meal protein for easy digestion and feed conversion, and is sold in state-of-the-art foil bags that support freshness for up to a year with proper handling and constant refrigeration. 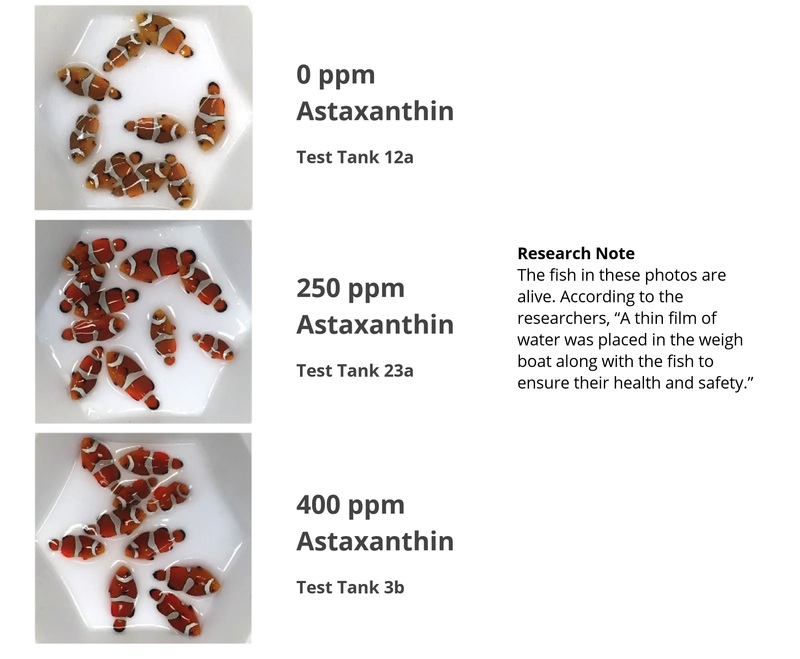 An executive study of the research on the optimal level of astaxanthin in feed for best color in clownfish is available on the APBreed page in the links and downloads tab.